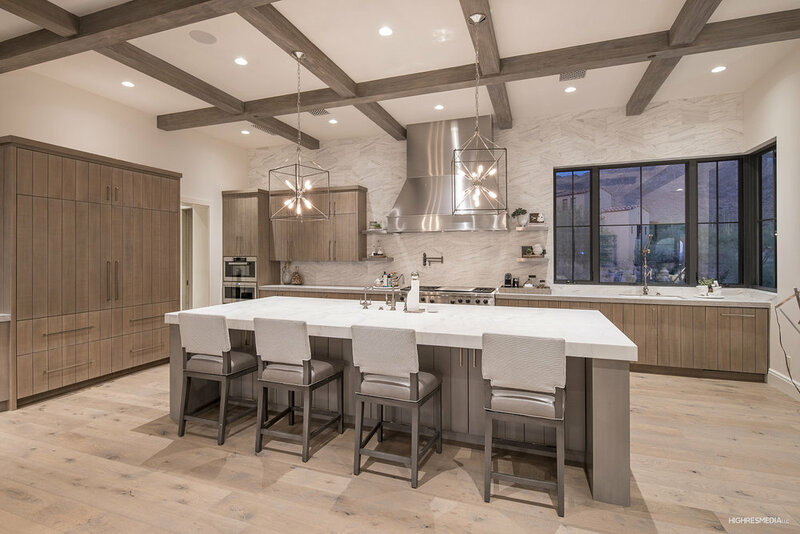 Truly one-of-a-kind in the Upper Canyon area in Silverleaf, this Calvis-Wyant built home exudes all the luxury one would expect in a warm and welcoming package. Situated with preserve and city light views, the home gently wraps the spacious backyard for the ultimate privacy. A one-level layout was thoughtfully planned for both entertainment and family time. A large formal living/dining room is anchored on a large stone fireplace with an adjacent built-in bar and walk-in wine cellar. French doors line the main corridor of the home leading to an incredible kitchen with marble finishes, generous custom cabinetry and dining area overlooking the family room with stone fireplace and retractable glass doors. Dual offices offer space to get thing accomplished while the inviting laundry room efficient with dual washer and dryers and a center folding island. The guest wing is home to a second family room/play room with three bedrooms suites - all including walk-in closets and unique bathroom designs. The master retreat is elegantly appointed with a gas stone fireplace, morning bar, and large dual-island walk-in closet with second washer/dryer. The master bath is designed around a free-standing tub with walk-in shower, dual vanities and dual water closets. The guest house will charm you with a great room overlooking a fireplace and nook with dining table and wet bar. Outdoors you'll find a living space with fireplace, flush-mount ceiling heaters, BBQ island, ramada with chandelier and fireplace, grassy areas, pool and spa and so much more. This very special home is one you won't want to miss. Want to learn more? Check out the photo tour and get more information here.